This paper describes the findings of a qualitative study to examine preservice teacher education students’ experiences and reasons for creating digital teaching portfolios. Also, it examines the advantages and disadvantages of creating digital teaching portfolios. Findings indicate that the process of creating digital teaching portfolios was a constructivist one that fostered self-confidence in students’ professional and technical skills. Also, students enrolled in the course to enhance their technology skills, for guidance in the process of developing a digital teaching portfolio, and to create a portfolio that would make them more marketable. Milman, N.B. (2005). Web-Based Digital Teaching Portfolios: Fostering Reflection and Technolog Teacher Education Students. 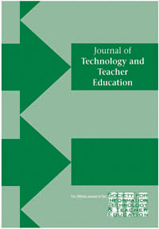 Journal of Technology and Teacher Education, 13 (3), 373-396. Norfolk, VA: Society for Information Technology & Teacher Education. Retrieved April 21, 2019 from https://www.learntechlib.org/primary/p/4513/. Erickson , F . (1986) . Qualitative methods in research on teaching . In M .C . Wittrock (Ed. ), Handbook of research on teaching, (3rd ed., pp. 119-161). Fo l ioVIEWS. (1996). (Vers ion 3.0) [Compu ter software]. Provo , UT: Folio Corporation. International Society for Technology in Education. (1999). Will new teachers be prepared to teach in a Digital Age? A national survey on information technology in teacher education. Santa Mon ica , CA: M i lken Exchange on Education Technology. Jackson, D. (1998). Developing student generated computer portfolios. Paper presented at the ninth annual conference of the Society for Information Technology and Teacher Education, Washington, DC. Lennex, L. (1998). Digital portfolios in secondary grades preservice teacher education. Paper presented at the ninth annual conference of the Society for Information Technology and Teacher Education, Washington, DC. Lyons, N. (1998a). Portfolios and their consequences: Developing as a reflective practitioner. In Lyons, N. (Ed.) , With portfolio in hand: Validating the new teacher professionalism (pp. 23-37). New York: Teachers College Press. Lyons, N. (1998b). Reflection in teaching: Can i t be developmental? A portfolio perspective. Teacher Education Quarterly, 25(1) , 115-127. National Council for Accreditation of Teacher Education. (1997). Technology and the new professional teacher: Preparing for the 21st century classroom. Washington, DC: Author. Piaget, J. (1977). The development of thought: Equ i libra t ion of cognitives truc tures. New York: Viking. Vygotsky, L. (1962). Thought and language. Cambridge, MA: MIT Press. Comparison of Peer Reviewing Between Paper-and-pen based review sheet and an Annotation Support System "FD Commons Annotator"